The Nameless Dwarf reboot, Annals of the Nameless Dwarf, is off to a great start. 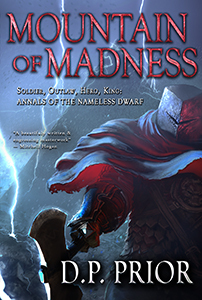 The first two books (Ravine of Blood and Shadow and Mountain of Madness) have already been released in print and ebook formats (a month ahead of schedule). Cover art for book 3, Curse of the Black Axe, is almost ready (the manuscript will receive another revision and proof read in the next few weeks, so we are on course for a mid-March release date). I’m 2/3rds done with the major revisions for Book 4: Land of Nightmare. Still have book 5 (Bane of the Lich) and book 6 (Fate of the Dwarf Lords) to revise, but at this rate the six novels rebooted from the original saga will be available by early summer. Last year I made a start with drafting book 7: King of Arnoch, and once I get some breathing space from my other writing commitments, I should be able to finish that book within a few months. Last night the structure, style, and rough outline for book 8: Sea of Weeping came as a sudden inspiration.I’m more excited about writing this than any of my other projects. It has a Captain Ahab feel, thematically, and it’s written in three first person points of view (Nameless, Nils, and Ilesa). Book 8 leads right into the already-written final installment of the Nameless Dwarf story, which is close to 200,000 words long in the current draft. As I get closer to releasing it, I’ll no doubt cut a fair amount of that, but it’s likely to still be between 150,000 and 170,000 words. I would love for the entire series to be wrapped up this year, but it really depends on how I do with my other work , which has serious deadlines! Once the first six books have all been released, we’ll be looking for an audiobook producer for the entire series. Enquiries to Laurie McLean. 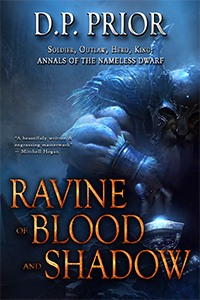 For the rest of February, Ravine of Blood and Shadow is discounted to $0.99 on Amazon, Kobo, Google, and Smashwords. If you have read any of the books, please consider leaving your feedback, however brief, on the retailer site of your choice. I can’t stress how much reviews have helped this series. Every review, good or bad, is very much appreciated.